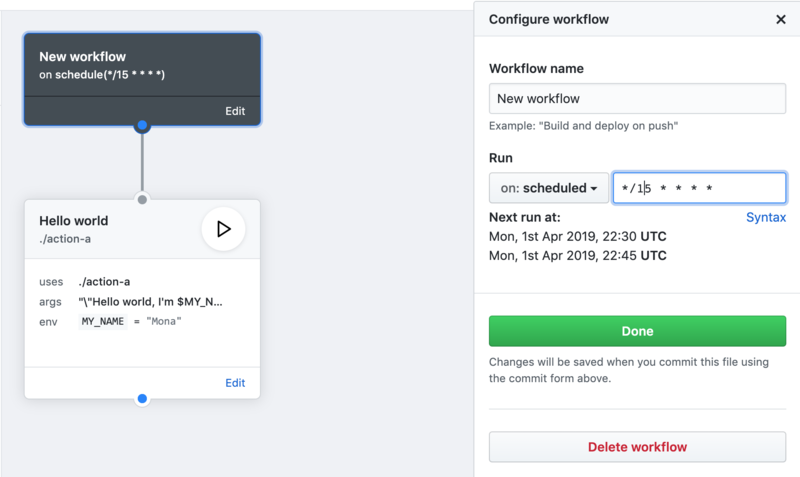 You can now schedule workflow executions in the main.workflow file or visual workflow editor. View all upcoming scheduled workflows in the Actions tab. You can schedule workflows in the main.workflow file or from the visual workflow editor. Both methods use cron syntax to set the time. See "Scheduling a workflow" to learn more about the syntax used in the workflow file. To schedule a workflow using the visual editor, select scheduled from the Run dropdown menu and use cron syntax to specify the date and time. Scheduled events use the UTC timezone. For example, schedule(0 0 * * *) will run every night at midnight UTC.